At the age of 15, I was pretty sure I was the biggest fan Green Day would ever have. Listened to them non-stop, wore out the vhs of the recorded woodstock mudfight, wrote out the lyrics on my school notebooks’ tabbed folders, and even made my own punk flower kerplunk! shirt. It was the hysteria that blessedly passed me by when all my friends went NKOTB-crazy, and it was my gateway into punk rock and a lifestyle I’ll always be grateful for. So, it’s pretty awesome that nearly 15 years later I can say I made a solid emotional investment in these boys. 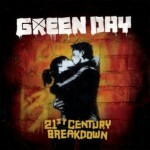 21st Century Breakdown is an ambitious album. Not only another concept album, but another rock opera. Arguably a more authentic rock opera than American Idiot, with three distinct acts and songs that tell the story better than most broadway musicals. But in spite of the high-concept, it’s still a Green Day album through and through, with irony, high-jinx, and true blue punk. The title track opens well and I envision it as probably the third single (sidenote, my one complaint about Green Day is the number of singles that get squeaked out of every album, resulting in overexposure, but I guess it’s a byproduct of their popularity). Know Your Enemy is probably the right opening single. But Viva La Gloria sold me on the album. Beautiful and wistful, but rock-y not sappy. The kind of song that just brings me joy. Last Night on Earth brings to mind Good Riddance but is a little less user-friendly, which I prefer. Peacemaker is the best song on the album, witty and super-fun to listen to, mixing different styles with their signature sound. 21 Guns is also a ballad-type song, but it’s respectful and mature and reminds me a lot of Psychotica’s Soldier of War (which makes me smile since I know Billy Joe and Pat are friends, I feel like I’m in on a secret). The whole album is fantastic, obviously intended to be listened to from start to finish, but that doesn’t mean that it needs to be. The songs stand well on their own and can probably be inserted into playlists easily. But it is very nice to sit and listen to the whole thing. I imagine someday it could even be staged, as is. Are you listening Off Broadway?